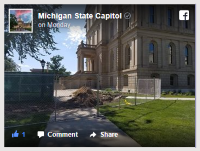 The Capitol’s grounds were carefully designed to enhance—rather than compete with—the Capitol. The original scheme called for rows of trees around the perimeter of Capitol Square, forming a leafy frame for the building but keeping the interior grounds open for unobstructed views. This scheme was forgotten over the years as many trees were planted randomly all over Capitol Square. The original scheme is now being slowly reestablished. Existing interior trees are being allowed to live their natural lifespans. They simply won’t be replaced when they die. 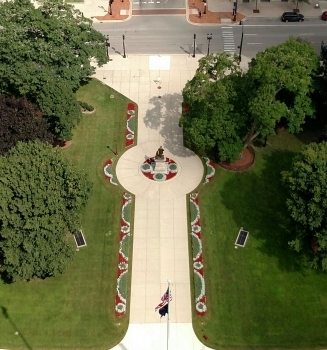 Besides many species of trees, an expansive lawn, and statues and monuments evoking Michigan’s past, take note of Capitol Square’s beautiful flower beds. These beds were designed by experts from the Landscape Architecture Program at Michigan State University and are based on historic research of Capitol Square’s original planting scheme. The two long curving beds in front of the House and Senate wings feature perennial flowers and plants. Authentically designed in the style of the Victorian period, they reflect the influence of English garden designer Gertrude Jekyll, whose writings inspired many American gardeners of the day. The beds provide masses of color throughout the blooming period. Each bed is a mirror of the other, with flowers arranged so that colors range through the color spectrum from hot to cool. 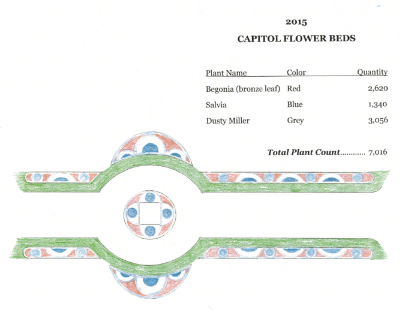 Hot colors (yellows, oranges, reds) are found at the Capitol’s front entrance. As the beds curve away, they range into cool colors (blues, purples, whites) at the outer ends. The beds flanking the entrance sidewalk and surrounding the statue of Austin Blair are also based on a popular Victorian planting scheme called “carpet bedding.” In this scheme, annual flowers were planted in elaborate, often geometric, designs. This became very fashionable, particularly around grand public buildings and large private estates. Once again, Capitol Square’s spectacular flower beds achieve the Victorian ideal—they are beautiful, authentic to their period, and complement rather than distract from the building. In one respect, however, they do differ. Victorian beds often featured exotic and expensive plant material. Our beds are designed with the public use of the Capitol in mind and are as hardy and maintenance-free as possible. 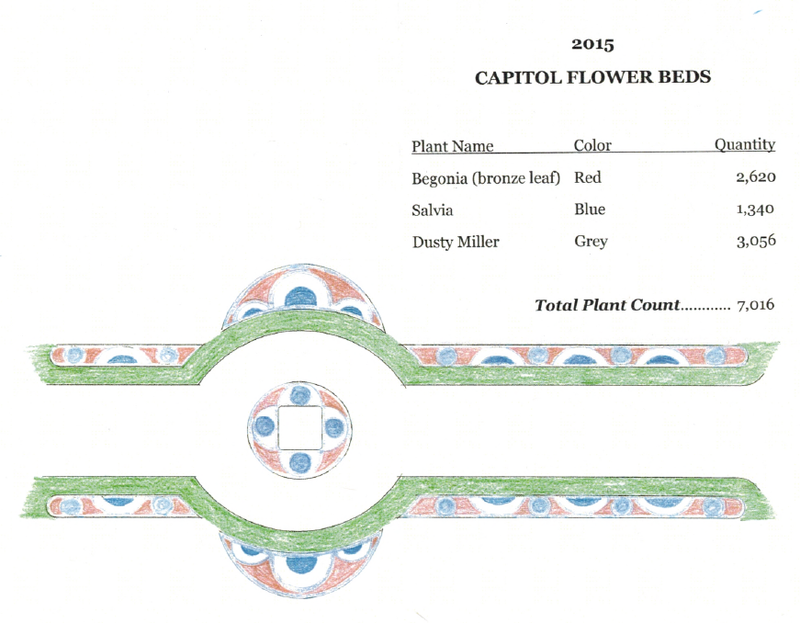 Designing ”carpet bedding” requires a good knowledge of annual flowers, a keen eye for color, and the ability to calculate how many plants will be required. This design is the work of the Capitol Event Coordinator, Barbra Thumudo. Every year dozens of volunteers join Capitol staff to plant Victorian inspired “carpet bedding” along the Capitol’s main sidewalk. This overhead view of the beds showcases the red, white, and blue swag pattern used in 2015.